We are all familiar with the stories of how famous models were scouted back in the day. Take Kate Moss being discovered as a 14-year-old smoking a cigarette in an airport, a 15-year-old Naomi Campbell walking through Covent Garden or a teenage Jourdan Dunn found while browsing in Primark. All were stopped and asked “Have you ever considered modelling?” and the rest is fashion history. Those models just happened to be in the right place at the right time. But in the days of social media, models can be seen whenever and wherever they want, found via hashtag rather than scouting the streets. Dutch model Alyssa Traoré is one such social-media success story. After years of hunting for an agency that would sign her, she took matters in to her own hands, sharing headshots of herself via Instagram in the hope of catching an agent’s eye. It worked. Now she’s modelled for everyone from Tommy Hilfiger and Michael Kors to Erdem, Prada and Valentino. But it works both ways; while Instagram can be a great platform for aspiring models to show off their portfolios, it can also be just as useful for agencies trying to find the next big name. IMG Models started their We Love Your Genes hashtag (#WLYG) specifically to find aspiring models just like Traoré, encouraging Instagrammers to upload photographs of themselves using the hashtag to get themselves noticed. She found herself discovering amazing talent from all over the world. The hashtag opened doors for girls who couldn’t afford to travel to castings or who don’t live in big cities, where you are most likely to get scouted. “The stories are crazy from some of the girls that we’ve found,” said Rose. “There’s a girl we’ve been in touch with from Venezuela and where she lives is quite dangerous so she doesn’t have the opportunity to travel. Social media can be career changing for the genetically blessed in terms of being discovered and as a tool for self-promotion, but being a model in the digital age can have its downsides too. Last year, a study found that Instagram was the worst social network in terms of its impact on mental health, linking it to depression and anxiety. Although the modelling world might seem full of self-confidence, that’s clearly not the case. 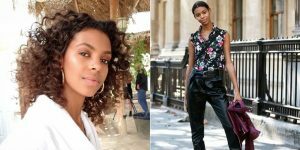 “You might get insecure comparing yourself to another girl at a casting, but now you can compare yourself non-stop at any second of the day on Instagram,” adds Traoré. Recently Kendall Jenner came under fire from many of her modelling peers, for making comments about her ability to be selective about the jobs she agrees to take on. Of course, Jenner was born into a famous family and came with a ready-made fortune and following; she can naturally be more choosy about her work. She’s since clarified her comments, explaining that her words were intended to be “entirely complimentary” and that the respect she has for her peers is “immeasurable”. While Jenner has worked hard to prove her worth as a model, regardless, the fashion industry has a reputation for success being all about who you know. IMG is hoping that the We Love Your Genes initiative will help those who are less well connected to get a foot on the ladder. #WLYG is more than just a hashtag. It levels the playing field, giving equal opportunity for aspiring models to feel seen, no matter what your circumstances or where you are in the world. A bejewelled trio of fragrances fit for an empress. We decode fashion’s new approach to partywear – and it’s never been glitzier. Deeply nourish the soul with a stay at the E&O. This local product is available in shades that will perfectly complement Asian skin tones beautifully. Julie Brangstrup, CEO of Cash & Rocket, explains how she is raising vital funds to help women and children worldwide.